Green Couch Grows a Sequel with Best Treehouse Ever: Forest of Fun! It’s time to build another treehouse! In the new stand alone sequel to the Golden Geek Nominated Best Treehouse Ever (Best Card Game, Best Family Game, 2015), Best Treehouse Ever: Forest of Fun, players compete to build their best treehouse, outfitting their treehouse with cool rooms, and creating fun habitats for their favorite furry and feathered friends, while also making sure that their tree doesn't tip over and that their rooms are more impressive than all of their friends' rooms at the end of the game. In addition, our treehouse builders have leveled up their experience by visiting new locations in the forest that provide special abilities to help them in their new build. Building takes place over three weeks/rounds, and in each round, players use card drafting and spatial reasoning to add five new rooms to their treehouse. Players must pay attention to the other treehouses being built since they take turns determining which types of rooms score for everyone at the end of each round. At the end of the third week, the winner is the player with the best treehouse ever! But the best part? Best Treehouse Ever: Forest of Fun can be combined with Best Treehouse Ever to play up to 8 players! 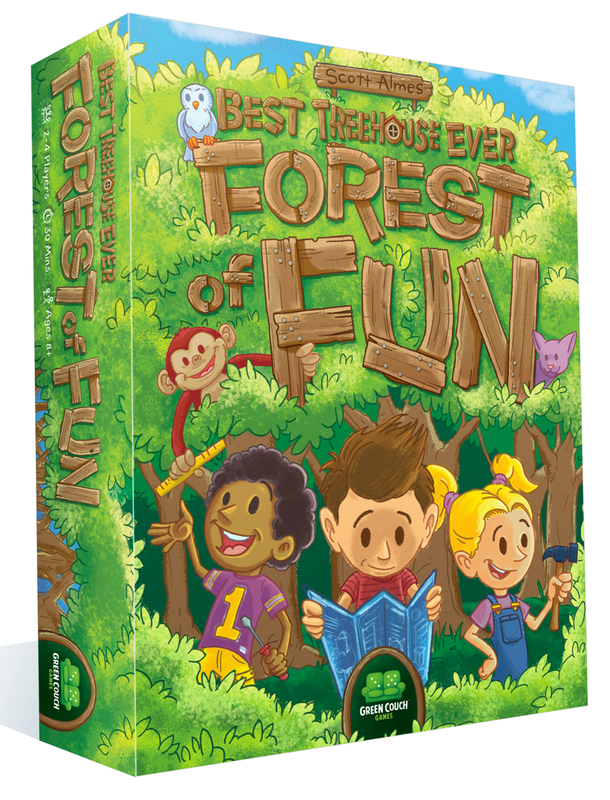 Best Treehouse Ever: Forest of Fun will be the first “Big Box” game from Green Couch Games allowing owners of the original Best Treehouse Ever to store it all in one convenient box. The game includes 60 Room Cards with all art, 12 Animal Cards, 4 Starting Tree Cards, 6 Scoring Cards, 10 Location Cards, 4 Scoring Tokens, a folding Score Board, and 4 Balance Markers. The game will feature more great art from Claire Donaldson and Andy Jewett building on the foundation created by Adam McIver with Best Treehouse Ever. Best Treehouse Ever: Forest of Fun is a game for 2 to 4 players (or up to 8 when combined with Best Treehouse Ever), ages 10 and up and is designed by Scott Almes. The game is set for a Kickstarter campaign in Fall of 2017 with a Q2 2018 release. Green Couch Games springs ahead with the ultimate “Filler” card game!